Nail colours can be traced back nearly 4000 years. Egyptians used nail colour to signify social order red being the most desired. Queen Nefertiti, wore ruby red, while Cleopatra favoured deep rust red. Women of lower social rank were only permitted pale hues. The Incas could well be the first to use nail art; their fingers were often painted with eagles. French manicure made its first appearance in the 18th Century Paris, finding favour in the French Court and was revived in the 1920s and 1930s. For maximum results, prepare the natural nail, apply a coat of nail treatment and/or base coat, two layers of the coloured lacquer and a top coat. To aid drying, use Drip Dry drops and/or Rapid Dry spray. 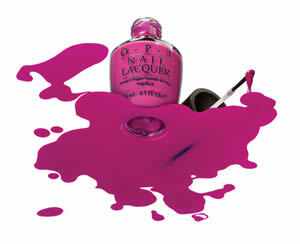 Never shake the lacquer bottle as this can create air bubbles, instead, roll gently between your palms. The Muppets Animalistic Designer...De Better! Divine Swine Excuse Moi! Gettin' Miss Piggy with It Gone Gonzo! Fresh Frog of Bel Air Meep Meep Meep Pepe's Purple Passion Rainbow Connection! Warm & Fozzie Wocka Wocka!